its relevance to nursing leaders. presence of the concept will be explored [3 ]. entrusted the care of his son to Mentor [7,8]. important role that “every nurse has to assume” (p. 35). and support the use of mentoring in succession planning . velop new nurse leaders [13,33-35]. skills and provides contextual feedback [35,39]. settings and be formal or informal in nature . be described simply as leaders developing leaders . fective engaging, and respectful communication [42,51]. spend time with the mentee [1 0,15,17,43,44,47,50,52 ,53]. development, rather than behaviours [41,61-63]. engage in the relationship, and 4) sharing of knowledge. administrationand is well respected amongst her peers. This model case contains all of the critical attributes. common goal of furthering Sally’s career. would facilitate an open caring relationship with Kevin. ship cannot be defined as a mentoring. Sarah to assist in her orientation to her new position. formal evaluation in 12 weeks. there is no time limit and no formal evaluations. will get over it” and walks away. shared to further the goal of the mentee’s development. the relationship is driven by the mentee [15,27,53,54]. zations must believe in the outcomes of mentoring. matching a n d mentorin g o ut c omes[45,46,52,64]. ployees motivation and professional development . dicators of mentoring that can be empirically meas ur ed . standing of its importance in today’s healthcare system. strategy to attract and retain new nurse leaders. an Australian Hermeneutic Phenomenological Study. 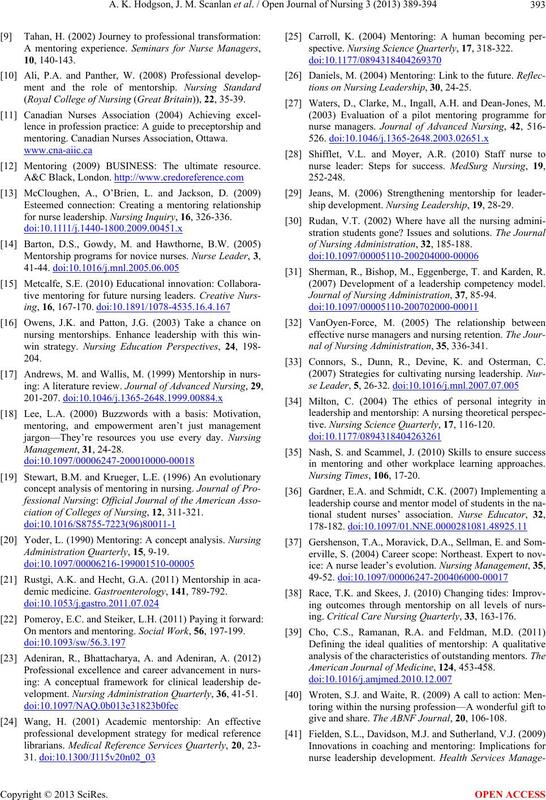 Journal of Nursing Scholarship, 43, 97-104. Administration Q uarterly, 31, 22-26. Association of Occupational Health Nurses, 50, 135. Block, L.M., Claffey, C., Korow, M.K. and McCaffrey, R.
tions. Nursing Forum, 40, 134-140. 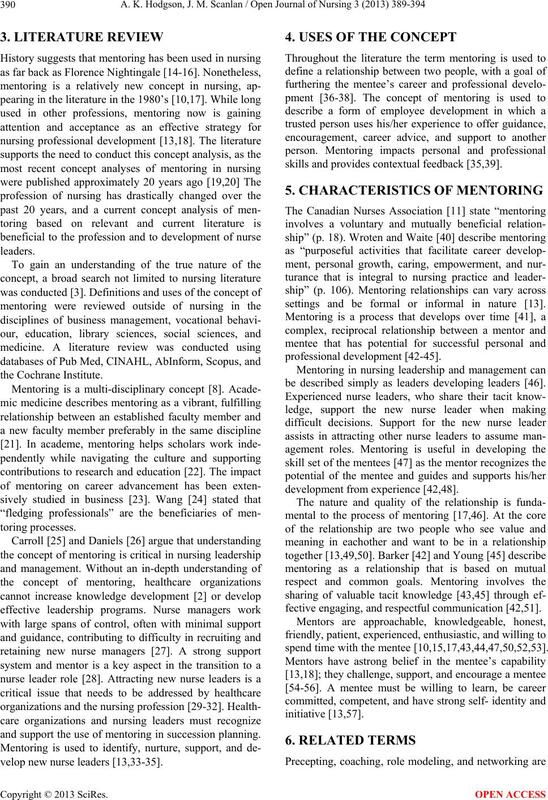 (Royal College of Nursing (Great Britain)), 22, 35-39.
mentoring. Canadian Nurses Association, Ottawa. Mentoring (2009) BUSINESS: The ultimate resource. for nurse leadership. Nursing Inquiry, 16, 326-336.
ciation of Colleges of Nursing, 12, 311-321. Administration Q uarterly, 15, 9-19.
demic medicine. Gastroenterology, 141, 789-792. On mentors and mentoring. Social Work, 56, 197-199.
velopment. Nursing Administration Quarterly, 36, 41-51.
spective. 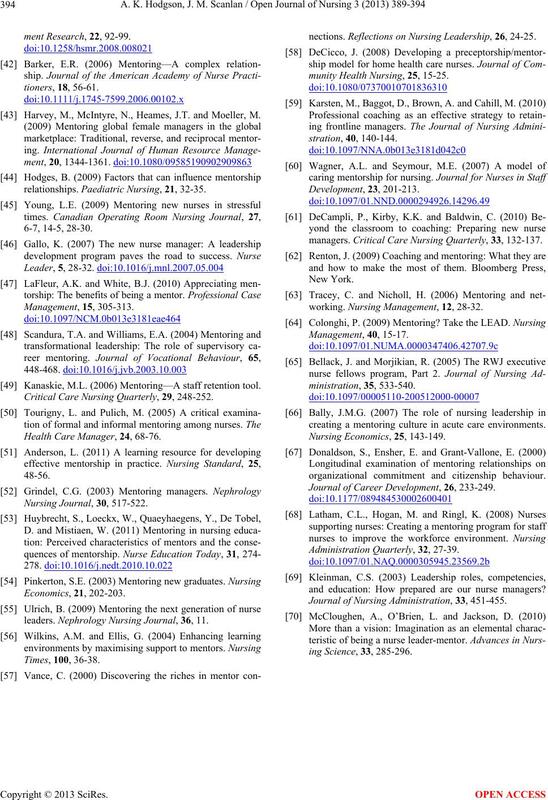 Nursing Science Quarterly, 17, 318-322.
tions on Nursing Leadership, 30, 24-25. Waters, D., Clarke, M., Ingall, A.H. and Dean-Jones, M.
ship development. Nursing Leadership, 19, 28-29.
of Nursing Administration, 32, 185-188. Sherman, R., Bishop, M., Eggenberge, T. and Karden, R.
(2007) Development of a leadership competency model. Journal of Nursing Administration, 37, 85-94.
nal of Nursing Administration, 35, 336-341. Connors, S., Dunn, R., Devine, K. and Osterman, C.
tive. 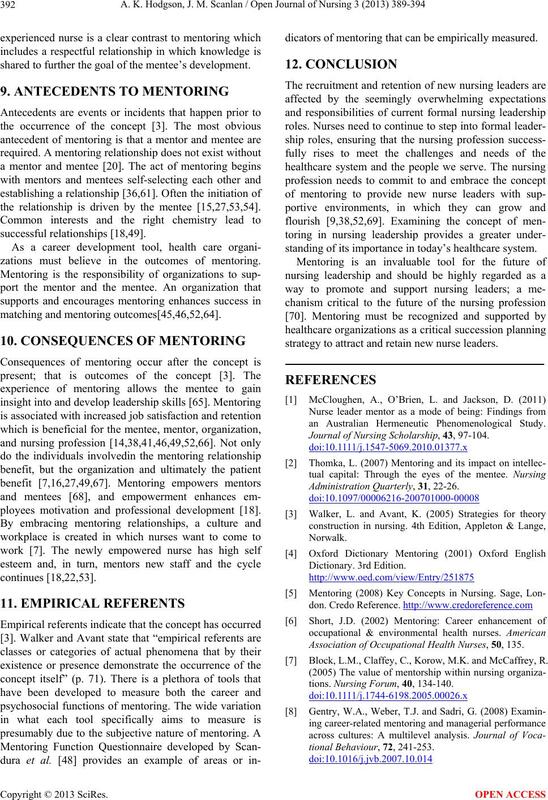 Nursing Science Quarterly, 17, 116-120.
in mentoring and other workplace learning approaches. ing. Critical Care Nursing Quarterly, 33, 163-176. American Journal of Medicine, 124, 453-458.
give and share. The ABNF Journal, 20, 106-108. Harvey, M., McIntyre, N., Heames, J.T. and Moeller, M.
relationships. Paediatric Nursing, 21, 32-35. Kanaskie, M.L. (2006) Mentoring—A staff retention tool. Critical Care Nursing Quarterly, 29, 248-252. Health Care Manager, 24, 68-76.
leaders. Nephrology Nursing Journal, 36, 11.
nections. 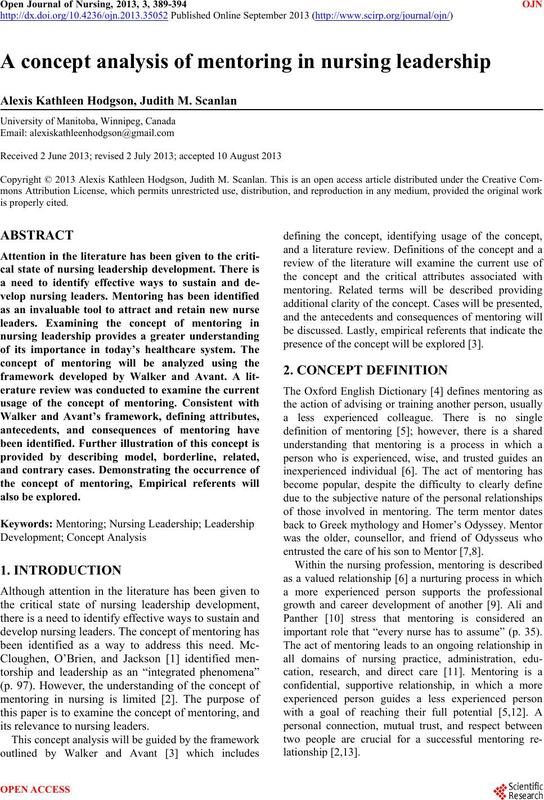 Reflections on Nursing Leadership, 26, 24-25.
munity Health Nursing, 25, 15-25.
managers. Critical Care Nursing Quarterly, 33, 132-137.
working. Nursing Management, 12, 28-32.
creating a mentoring culture in acute care environments. organizational commitment and citizenship behaviour. 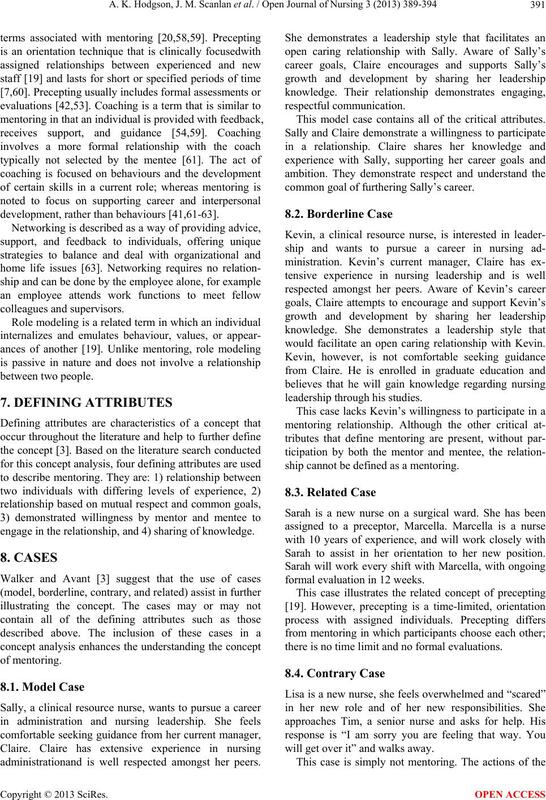 Journal of Career Development, 26, 233-249. Administration Q uarterly, 32, 27-39.
and education: How prepared are our nurse managers? Journal of Nursing Administration, 33, 451-455.